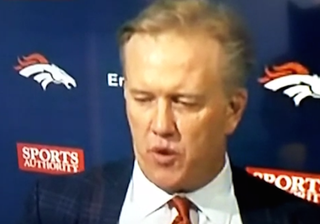 Was it a slip of the tongue by John Elway at his conference today, or the truth? Hell, you've earned it, John. Thank yourself. "Heh, sorry everyone. I didn't mean me, John Elway, the guy who still has a job. I meant that guy I fired, John Fox. God, I gave him everything and he couldn't get a Super Bowl. Anyway, thanks to him."